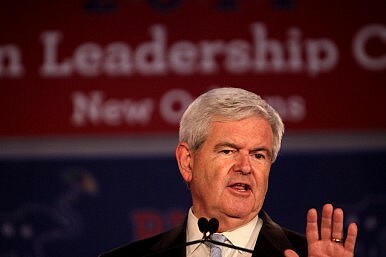 Newt Gingrich wants a moon base to help stop China dominating space. There are more pressing concerns. My post last week on Republican candidate Newt Gingrich’s vow to have a base on the moon by the end of his second term in office has prompted an interesting debate among readers, with those disagreeing with the thrust of my article – and the analysts I spoke with – falling into two broad categories. The first are those that suggest that the cost wouldn’t necessarily be prohibitive, the others suggesting that maybe it would be, but the point is that at least he has a vision. I would still beg to differ on both counts. Virgin Galactic, one of the best-known of the private actors involved in space, says it has had about 430 bookings at $200,000 apiece for its sub-orbital space flights, which could begin sometime next year. That puts the money Virgin is bringing in at $86 million, despite the company having already been around for 8 years. It’s difficult to see how a $10 billion annual moon base would be worth the investment. One commenter suggested other incentives, like allowing mineral royalties. But are mineral royalties on the moon really the United States’ to be giving away? So how about bringing other countries onboard to make such incentives at least a little more plausible? Gingrich presumably doesn’t want that – or at least not if it’s China – arguing that the Chinese will dominate space if the United States doesn’t step up with a “romantic” vision. But if the door is flung open to private investors, it’s not going to be easy identifying and blocking any Chinese involvement, however indirectly. All this means that Gingrich has come in for some considerable flak not just from his opponents, but a long list commentators. So what about that other argument – that the details don’t matter, that it’s all about having a grand vision? Again, I have to disagree. One of the big problems that we’re going to see (indeed already have seen) from the candidates this election year is a refusal to level with the public. They have visions aplenty, it’s just no one wants to say how they are going to pay for it. There are some vague ideas about cutting waste (that universal political favorite), and of course Peter is happy to see Paul’s favorite government programs cut, but not his own (and Paul feels the same way about Peter, and thinks that if Peter also paid a bit more in taxes that everything would be OK to boot). And Barack Obama suggests that if countries like China would just play fair, that the United States would once again lead the world, including in manufacturing. The trick is, apparently, to make everyone think that they are the only ones who won’t really have to sacrifice anything. (And it’s been fascinating on social media to see how generous people are with other people’s money. Because if only they earned more, they’d hand it all over for the greater good. This isn’t, of course, exclusive to the United States. Politicians pander in virtually every country. But that doesn’t make it right, especially in a country that is in debt to the tune of $135,000 for every tax payer. And it doesn’t mean that the U.S. should be spending billions (because it’s clear that this would take significant public investment) on projects just because they might make Americans feel warm and fuzzy inside. The Economist has taken what seems an eminently sensible position on the whole U.S. economy issue, arguing that fixing the U.S. economy will require a mixture of painful spending cuts and tax hikes. Unfortunately to anyone but the shrinking middle in U.S. politics, this is heresy. Until this situation is resolved though, the grand feel-good visions should probably wait. Gingrich’s Moon Base VisionTrump's Space Force Misses the Mark on Chinese and Russian Space ThreatsChina’s Struggling Middle Class Deserves BetterUS-China: Civil Space DialogueHow Far Can American Exceptionalism Go?